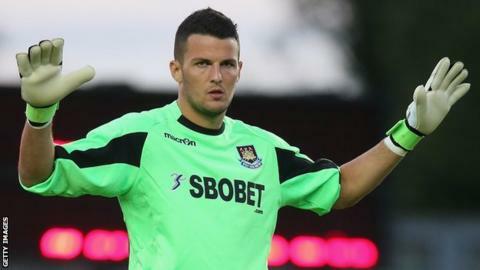 Ipswich Town have signed West Ham goalkeeper Stephen Henderson on loan for three months. The 24-year-old will compete with Scott Loach and Arran Lee-Barrett for a starting place in Paul Jewell's side. His two appearances this season have both come in the League Cup. "I've not played much football this season so when I was told I could go out on loan, my agent contacted Ipswich and once I knew they wanted me, that was it," he told the club website. "I've played here a few times. It's a fantastic football club and I'm really looking forward to the three months here and showing what I can do." Town came close to buying Henderson from Portsmouth in January last year but a deal was never finalised. The former Aston Villa youngster ended up going to the Hammers on loan at the back end of last season before joining permanently in the summer. He is likely to replace Loach for Saturday's trip to Hull, after two costly errors from the former Watford keeper helped Cardiff to a 2-1 victory 10 days ago. "Scott's confidence has taken a little knock just lately - that happens to every player at some stage," said Jewell. "He'll get through it and be better for it but bringing Stephen in gives us other options, along with Arran as well. "It's been well documented that we tried to bring Stephen to the club last season but Portsmouth did not accept our offer. "We weren't the only club after him and obviously he's a West Ham player now and playing at a Premier League club." Henderson's arrival takes the number of loan players at Portman Road to eight. Championship teams can name five loanees in their matchday squad, however Daryl Murphy and Guirane N'Daw do not count towards the quota, as they have been brought in from clubs outside of England.